At Thanksgiving we talk a lot about giving thanks, and this embroidery pattern makes a great decoration to have displayed for the holiday. The spray of flowers and stylized text are both classic and fresh. But giving thanks isn't only something we do one day a year. Stitch this design and keep it around as a reminder all year. It would be perfect to keep in an area you spend time in daily or even in a child's room. This design would make a beautiful pillow, or as a featured element on a table runner. For all year display, I would recommend using it as wall art. Frame it in an embroidery hoop or a standard frame. The pattern is designed to fit within a 5x9-inch embroidery hoop, but it will also work nicely in an 8-inch hoop. Continue to 2 of 2 below. To download the Give Thanks pattern, open the JPG and save to your computer. Print it out and use your favorite tracing/transfer method or water-soluble stabilizer. Linen gives this a classic look, or go bold by selecting a bright solid color. Suggested colors are: DMC 3803 (purple), 326 (deep red), 921 (orange), 977 (gold), 934 (forest green), 938 (brown) and 822 (natural). Use three strands of floss throughout. Embroider the text using back stitch for "Give" and chain stitch for "thanks". Embroider the large open flowers and leaves with satin stitch and a modern floral look. Fill the centers of the flowers and stitch the tiny buds with french knots. Stitch the petals with lazy daisy detached chain, and the stem with back stitch. 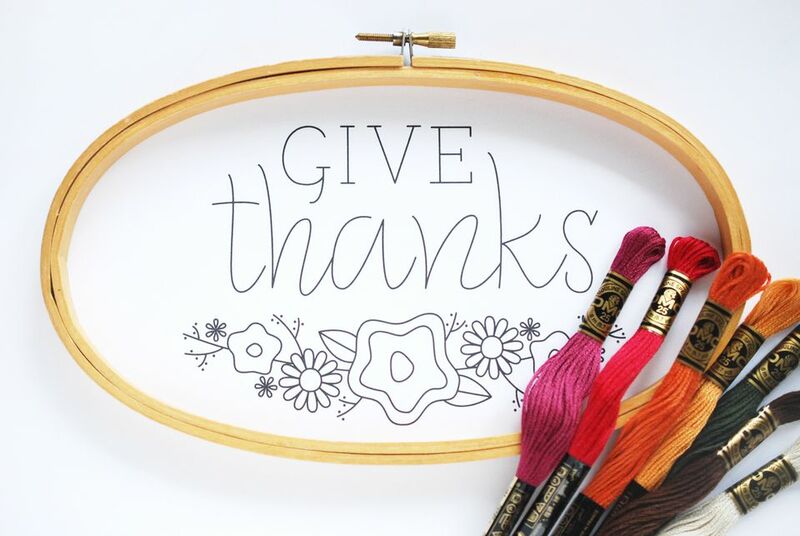 However you choose to stitch this design, may it be a reminder to be thankful for every blessing (and hopefully embroider is in that list of things you're thankful for!). Please Note: This pattern is copyrighted © by Mollie Johanson and is licensed to About.com, Inc. This pattern is free for your own personal use and creating finished embroidery available for sale in small quantities. Please do not redistribute this pattern in any way.